The Archbishop of Canterbury on Tuesday said that he was "profoundly sorry" to the homosexual Christian community for any "carelessness" by the church that would "undervalue them," adding that the church must regain a "sense of balanced liberties" in discussing divisive issues. 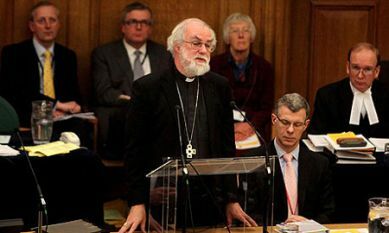 In his presidential address to the Church of England's General Synod, Dr. Rowan Williams spoke at length on the topic of homosexuality, saying that real issues in the debate have been obscured by "fantastic overstatement from zealots on both side," giving examples of the recent ordainment of a homosexual bishop by the Episcopal Church of Los Angeles and the anti-homosexuality laws that have been passed in Uganda. Williams said that the liberties taken by the Episcopal have had a "devastating impact" on the freedom of other Anglicans to "proclaim the faith without being cast as an enemy of public morality," while the freedom claimed by claimed by "African Anglican to support anti-gay legislation likewise has a serious impact on the credibility of the gospel in our setting." "The debate over the status and vocational possibilities of LGBT people in the Church is not helped by ignoring the existing facts, which include many regular worshippers of gay or lesbian orientation and many sacrificial and exemplary priests who share this orientation," he added. The Archbishop made similar remarks on the topic of euthanasia saying that, "There are ways of speaking about the assisted suicide debate that treat its proponents as universally enthusiasts for eugenics and forced euthanasia, and its opponents as heartless sadists, sacrificing ordinary human pity to ideological purity." "All the way through this, we need to recover that sense of a balance of liberties and thus a conflict of what may be seen as real goods – something of the tragic recognition that not all goods are compatible in a fallen world," he continued. "And if this is true, our job is not to secure purity but to find ways of deciding such contested issues that do not simply write off the others in the debate as negligible, morally or spiritually unserious or without moral claims." Williams went on to say that opponents must come to have a "three dimensional" viewpoint of each other in order for progress to be made. "Seeing something in three dimensions is seeing that I can't see everything at once: what's in front of me is not just the surface I see in this particular moment," he said. "So seeing in three dimensions requires us to take time with what we see. It may help us look more critically at solutions that seek to do much all at once; and perhaps to search for structures that will keep open the ability to learn from each other," he added. Williams concluded by saying that such a viewpoint will allow the church to "show to the world a face rather different from that anxious, self-protective image that is so much in danger of entrenching itself in the popular mind as the typical Christian position." "I deeply believe that this Church and this Synod is still capable of showing that face and pray that God will reveal such a vision in us and for us."